I got my pie for my money and my money for my pie. I got 99 problems but a pie ain’t one. You can find me in the club, pocket full of crust. I got that pie you need if you want your belt to bust. Ain’t nothing but a pie thang baby! Got that lemon fillin makin me crazy! It takes pie to make a thing go right. It takes pie to make it out of sight! Preheat it! I wanna bake right now, I’m Arielle and my pies throw down. I’m not internationally known, but I got you with the pies and scones. Ok, I’ll stop now. Also, I don’t make scones. Anyway, this is my January pie! There are some beautiful meyer lemons at the markets now, and this pie makes great use of them. If you don’t care about eating gluten free you can substitute your favorite crust. The rest of the pie is naturally gluten and dairy free, featuring a bright lemon filling based on Caroline Beck’s genius recipe for olive oil lemon custard. And also, it’s got half the amount of meringue as one of those wacko mile-high meringue pies. Why so much meringue, pie? I want just enough to add a sweet foil to the tart lemon filling, not a big floppy pile of egg white blob that doesn’t fit on my fork. One other cool thing about this recipe- it borrows the Cooks Illustrated technique of adding a gel made from corn starch to the meringue which allows you to pile the hot meringue on hot filling, and you can eat it right away with no chilling, in case you’re pressed for time or want your remixed meringue pie hot and fresh out’ the kitchen. Preheat oven to 350 degrees. Fit a homemade or store-bought pie crust into a 9-inch pie plate (I used the recipe copied below); line crust with parchment paper and fill with dried beans or pie weights. Bake until crust is lightly browned, about 35-45 minutes. Carefully lift and remove paper with pie weights and let crust cool. Make the lemon filling. Place the 3 whole eggs, 1/2 cup sugar, lemon zest, lemon juice, and vanilla extract in a blender and blend until smooth and frothy. Stream in the olive oil with the motor running. Pour into a double boiler or bowl set over gently simmering water on the stovetop. Whisk together 1 cup cold water and 1/4 cup cornstarch and add to the lemon mixture in the double boiler. Stir until the mixture thickens up (it should reach 160 degrees for fully cooked eggs, or hold at 140 degrees for 3 1/2 minutes). Make the meringue. Mix 1 tablespoon of cornstarch with 1/3 cup water in small saucepan; bring to simmer, whisking occasionally at beginning and more frequently as mixture thickens. When mixture starts to simmer and turn translucent, remove from heat. Let cool while beating egg whites. Beat egg whites and vanilla until frothy. Beat in the sugar 1 tablespoon at a time, until sugar is incorporated and mixture forms soft peaks. Add cornstarch mixture, 1 tablespoon at a time; continue to beat to stiff peaks. 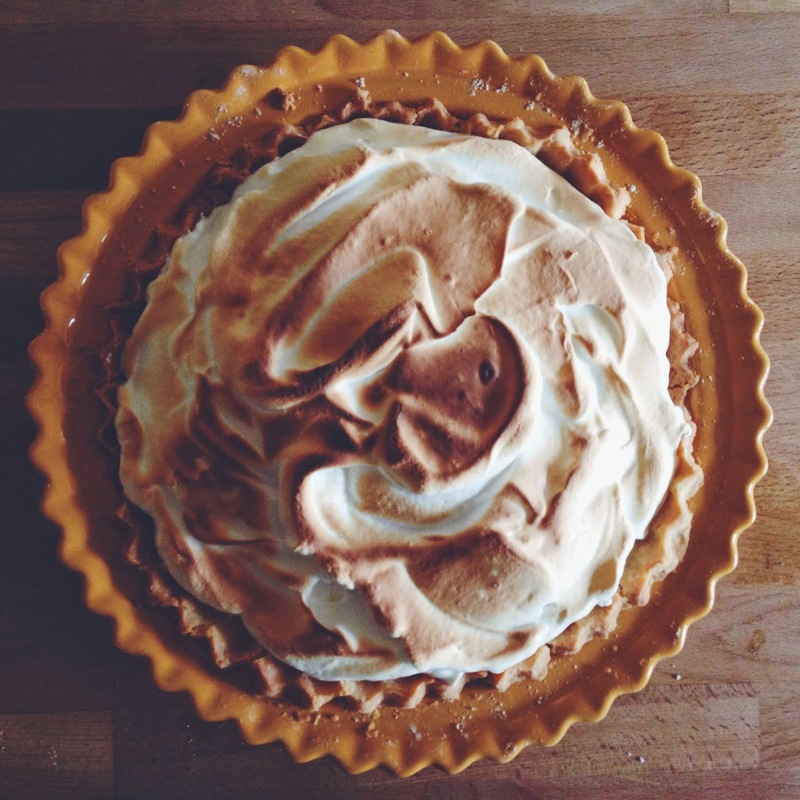 Using a rubber spatula, distribute the meringue evenly around edge and then center of the pie. Use a spoon to create peaks all over meringue. Turn on your broiler to high and adjust your oven rack to the top position. When the broiler is hot, slide the pie onto the rack. Keep the oven door cracked and watch carefully as the meringue browns under the broiler- this happens fast! Turn the pie if needed, to ensure even browning. Remove pie from oven. Let cool to room temperature, and then eat or refrigerate. Mix the flour, salt, and sugar in a medium bowl. Add the shortening and cut in with a pastry knife until the mixture has the texture of coarse sand. Scatter the vegan butter pieces over the flour mixture and cut in with a pastry knife until the mixture is pale yellow and resembles coarse crumbs, with butter bits no larger than small peas. Sprinkle 4 tablespoons of ice water over the mixture. With a rubber spatula, use a folding motion to mix. Press down on the dough with the broad side of the spatula until the dough sticks together, adding up to 1 tablespoon more ice water if the dough will not come together. Flatten the dough into a disk, wrap in plastic wrap and refrigerate at least 1 hour and up to 2 days before rolling. Remove the dough from the refrigerator (if refrigerated more than 1 hour, let stand at room temperature until malleable). Place the dough on a lightly floured sheet of parchment paper, dust the top with more GF flour, and top with another sheet of parchment paper. Roll the dough into a 12-inch circle between the sheets of parchment. Transfer the dough to a nine-inch pie plate and crimp the edges. That is one fine looking pie, and a GREAT photo!! !